Defending champions Alan Clyne and Greg Lobban marched into the men’s world doubles semi-finals this evening after defeating Welsh seventh seeds Peter Creed and Joel Makin, 11-4, 11-7. The top seeds remain unbeaten in Manchester as they look to defend the title they memorably won Down Under last year. They’ll meet Kiwi pair Paul Coll and Campbell Grayson, the fourth seeds, in the semi-finals tomorrow, 6pm, after they ended the run of England’s Tom Richards and Daryl Selby in two tough games, 11-7, 11-7. Lisa Aitken and Doug Kempsell also remain unbeaten this week having topped Group A of the mixed event seeing off South African pair Christo Potgieter and Milnay Louw earlier today 11-5, 11-8. 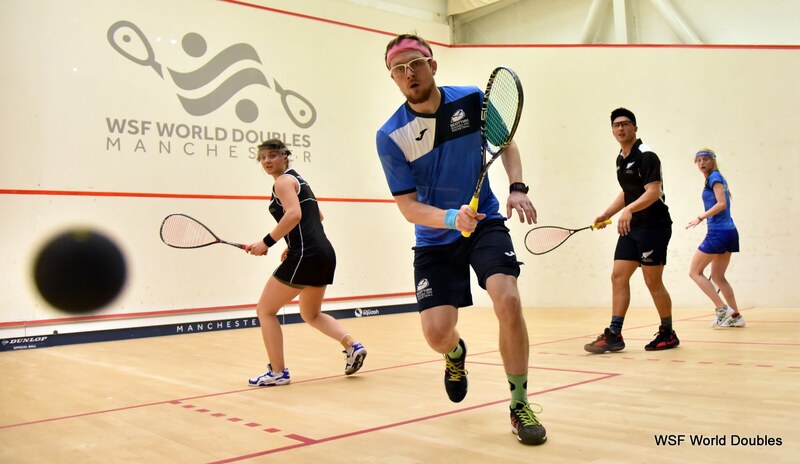 The Scots beat defending champions Joelle King and Paul Coll from New Zealand yesterday and English duo Adrian Waller and Victoria Lust as well as Wales’ Joel Makin and Deon Saffery on Tuesday meaning they head into the last eight high in confidence. 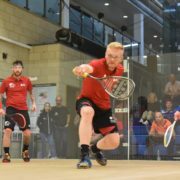 Ninth seeds Aitken and Kempsell will face off against Peter Creed and Tesni Evans (7) of Wales on Friday, 11am, for a place in the semi-finals. Elsewhere, Kevin Moran and Doug Kempsell bowed out the men’s doubles main draw after losing this afternoon to England’s Declan James and James Willstrop, 11-5, 11-6 in their final Group D match. 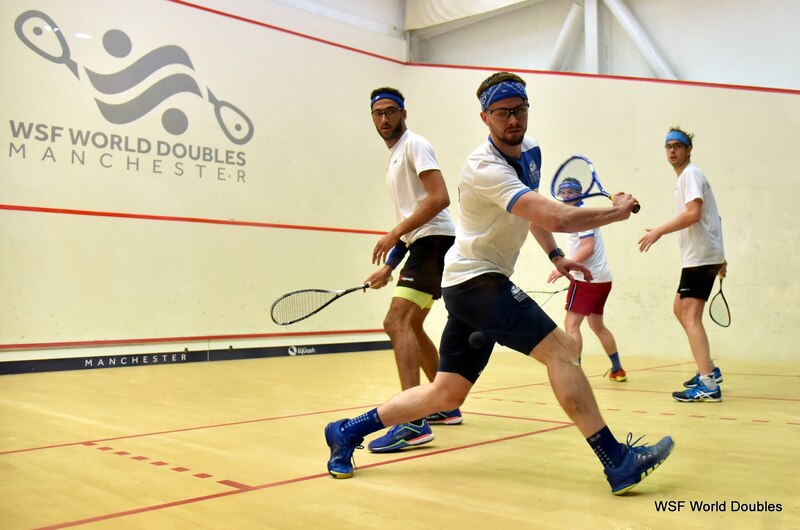 James and Willstrop this evening knocked out last year’s finalists David Palmer and Zac Alexander from Australia in a 77 minute epic quarter-final, 11-10, 6-11, 11-9. At 4pm tomorrow Moran and Kempsell take on Indian pair Vikram Malhotra and Mahesh Mangaonkar in a 9-16 play-off clash. 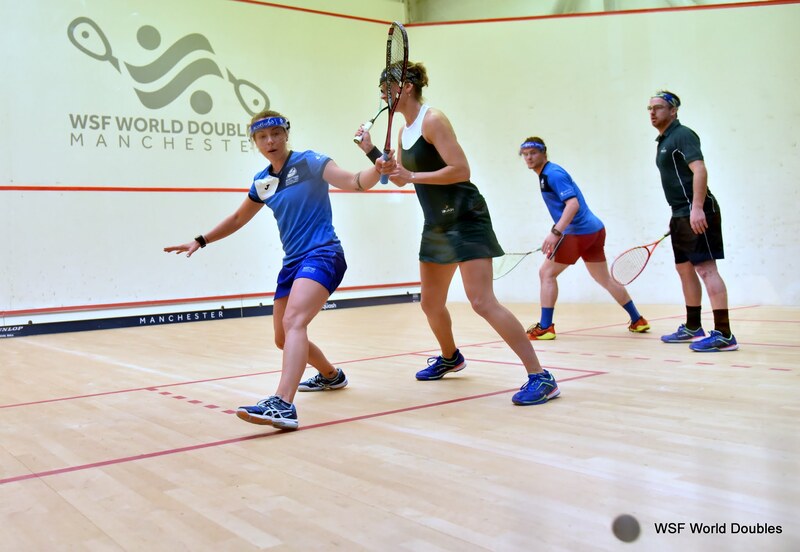 Carrie Hallam and Chris Leiper also exited the main draw at the group stages today after defeats to Columbians Andres Herrera and Catalina Pelaez, 11-9, 11-5, and Kiwis Zac Millar and Amanda Landers-Murphy, 11-5, 11-9. They now take on Joel Makin and Deon Saffery in a 17-20 play-off match tomorrow at 11am. Friday at 5pm, Carrie Hallam and Lisa Aitken take on Aussies Sarah Cardwell and Christine Nunn in a 9-13 women’s doubles play-off match.